Corporate bonds can provide stability and protect against equity roller-coasters. 2018 was a bumpy year for shares. The Australian benchmark index the S&P/ASX200® finished down approximately 2.8% including dividends, 6.9% excluding them. The main drivers of the downturn were geopolitical events, especially the threat of trade wars and rising US interest rates. The decline from September onwards effectively wiped out the year’s gains. A portfolio heavily weighted to growth-style stocks would have likely lost money. On the flip side, while corporate bonds suffered some losses the Bloomberg AusBond Credit Index finished up almost 4%. Corporate bonds were largely unaffected by the numerous events that impacted shares. When the share market seems to be going up and up, it’s easy to overlook the cushioning effect of a solid fixed income foundation. But, in volatile times it’s increasingly important to ensure you protect the wealth you’ve built up. Investors with balanced portfolios (50:50 bonds and shares), may have found their share market losses balanced by their bond returns. It’s having a solid foundation of bonds that can help protect and stabilise most portfolios through volatile times. Investment-grade bonds are a defensive asset class. The stability and diversification they can offer really shouldn’t be overlooked. With the prospect of more uncertainty ahead, defensive assets are increasingly on the radar of investors. So, now’s a good time to consider if they are right for you. Corporate bonds have traditionally been popular among institutional investors. Most bonds are issued in $500,000 lots which means in the past, self-directed investors and SMSFs have largely been excluded. But, that’s no longer the case. A broad range of bond ETFs and more than 50 different Exchange-Traded Bond units (XTBs), now provide access to the returns of bonds. All of them are available to trade on ASX. When you buy a term deposit, you know your return because you know the interest rate upfront AND when it matures (its end date). XTBs also have these ‘fixed’ features which provide you with comfort and predictability from day 1. Bond ETFs are continual – they don’t have an end date. This means they can’t provide the same level of predictability of returns. Also, they are pooled products – new bonds are added or removed, sometimes on a daily basis and there could be hundreds of bonds included. That’s good for diversification, but perhaps more importantly, it means you don’t know what your return will be. It also means you lose the certainty of what you’ve invested in. Remember, knowing your cash flow before you invest is at the heart of fixed income. Another way to access the benefits of bonds which retains the core ‘fixed’ elements, is via XTBs (Exchange Traded Bond units). Just like ETFs, XTBs are also accessible on ASX, so can be bought and sold at visible prices at any time. But they have one key difference – each XTB mirrors a single, specific bond. The maturity date when the face value of the bond is paid back (subject to no default by the bond issuer). Retaining this one-to-one relationship of an XTB with its parent bond keeps all of the ‘fixed’ or predictable elements. Just like in our Term Deposit example. Select specific companies you know and trust. Choosing exactly what you want to invest in keeps you in control, rather than leaving the decisions to a fund or ETF manager. 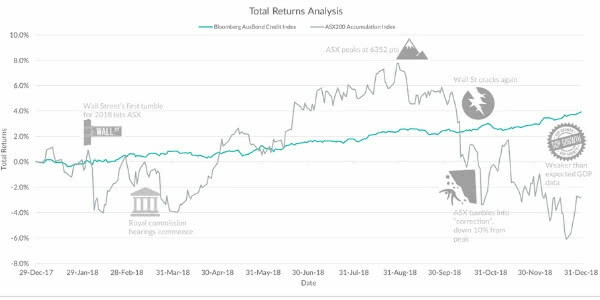 AusBond Credit Index returned close to 4%. XTB High Yield Starter Portfolio of 5 XTBs delivered a total return of 5.5%. Heard of corporate bond XTBs, but still have questions? Many investors have heard about corporate bond XTBs but have not yet had the time to fully understand them. If this is you, we are here to help answer your questions, so why not give us a call? Email us now to arrange a one on one call with XTB Relationship Manager Simon Riordan. Simon can help answer any general questions you have concerning bonds and XTBs. So, if you’ve not bought bonds before and want to talk it through with someone before you commit, Simon can guide you through the process. Any advice provided is general in nature and does not take into account any person’s specific circumstances. There is no charge for this service and he can call you at a time that works for you. Simon is not a stockbroker. If you decide to purchase XTBs you will still need to do this via your financial adviser, or your online share trading account.